You probably use either e-mail software on your computer, such as Microsoft Outlook, or web-based e-mail applications, such as Yahoo! Mail, Hotmail, or Gmail. For business communications, you might use a service, such as Google Apps, that includes e-mail. Though e-mail doesn’t seem flashy or modern, it’s still the most important engagement tool now in use, and it can tie in with social networks more easily than ever. In the example of an e-mail message, the social media links or graphics in the signature file were embedded using the WiseStamp app. Far more people have e-mail accounts and use e-mail daily to communicate than use social networks. By some counts, more than 3.1 billion people have e-mail accounts (The Radicati Group, Inc., 2011). Compare that number to the largest social network, Facebook, and its billion or so users. Social networks are catching up to e-mail but, so far, haven’t eliminated the need for more direct correspondence that’s separate and apart from social networks. Pass along the e-mail to others. Download a file attached to an e-mail. Click a link to visit a website. Play an embedded audio or video file. Fill out a form embedded into the body of the e-mail. Take a poll or survey embedded in the e-mail. Connect to someone’s social networking accounts. Click a link to begin an online purchase. E-mail is more than a message carrier: It’s a conversation starter as well as a multimedia and multifeatured communications tool to engage others beyond simple back-and-forth communications. Even as you set up your social networking presences, don’t discount e-mail marketing. Any marketer can tell you that a database of fully vetted e-mail addresses is a valuable marketing asset. Many online marketing professionals report that e-mail is still the most effective way to connect and engage with others because of the contained nature of e-mail messages in an inbox and people’s habitual use of e-mail. Do not force people to opt out of (or have to take a specific action to remove themselves from) your e-mails because you’ve subscribed them without their knowledge or permission, which can lead to negative feelings about your brand. The well-established e-mail marketing best practice of allowing people to opt in by giving express permission is still alive and well. E-mail marketing tools of the past were intended to broadcast (in one direction only) messages to many recipients. E-mail marketing platforms now integrate social media features to let recipients easily connect with you on social networks and not simply read your e-mail, delete it, and then forget about you. E-mail marketing tools also let you announce when you’ve sent a marketing e-mail or an electronic newsletter by autopublishing an update to your friends, fans, and followers on social networks. You may already have an e-mail sign-up form on your website or blog. Add ways for people to provide you with their e-mail addresses in your social networks. 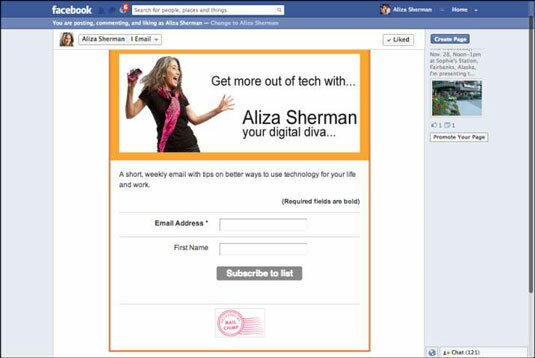 For example, integrate an e-mail sign-up app into your Facebook Page using any of the popular e-mail marketing tools, such as Constant Contact or MailChimp.